Amy Reddy's 90-year-old father is active and independent. But that doesn't stop Reddy from worrying about his well-being during the day -- especially when he doesn't answer her phone calls. Now, a local company's product is allowing Reddy to keep an eye on her father without cameras, emergency buttons or paying for in-home assistance. All Reddy has to do is ask Alexa. "Alexa -- ask TruSense about my dad," she asked her Amazon Echo Dot while our cameras rolled. "Billy started the day at 9:32 a.m. and is currently out of the home," Alexa responded. "His activity level has been slightly lower than average today." Reddy's father, Billy Trotter, is also a fan of the product. "It makes it easy for everybody," he said. 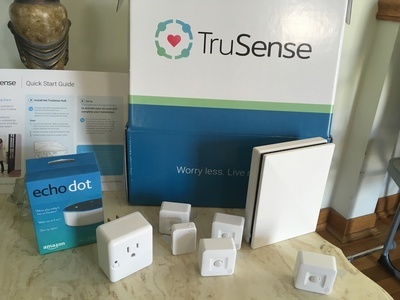 TruSense is a Cincinnati-based technological device that allows seniors "to age in a place in their own homes safely," according to Senior Vice President Rob Deubell. The product is sold and used all over the country. TruSense essentially monitors activity in specific rooms of a home. The idea is that the device would be able to determine if someone fell or hasn't moved for an unusually long amount of time. If there's a problem, TruSense can send a text message to a loved one and/or call an ambulance. It can also give activity reports on-demand, as Reddy demonstrated for us. Those reports are available through Amazon Echo or with TruSense's mobile app. "TruSense is a safety net that's always there to detect those kinds of issues and respond the way you want it to respond," Deubell said. "It's all customized to your family and your needs, so it follows the rules that you want it to follow." The small devise "sits in the background," Deubell said, and is not intrusive. No cameras are used -- only motion and contact censors. The starter kit costs $299 with monthly charges of $25 per month.